Ten Honda motorcycle dealers across England and Wales are offering customers the chance to be among the very first to try the latest new-for-2015 Honda motocross models at customer experience days across the country throughout October. Customers can choose from a fantastic line-up of Honda dirt bikes including the new CRF250R and 450R, as well as some stand-out Special Editions including the Buildbase and World variants. In addition Honda will debut the new CRF150RB Pata, emblazoned with Cup Pata graphics; as well as the 2014 season’s CRF450R Black Special. The new models will start arriving in Honda dealerships this month. 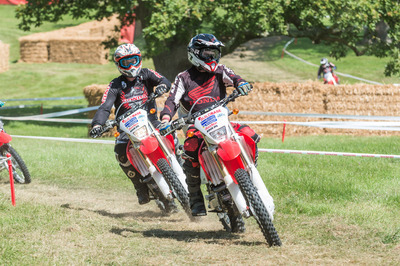 The events are organised and hosted on behalf of Honda (UK) and its dealers by four-time World Motocross Champion, Dave Thorpe. One of the UK’s top coaches, Dave heads up the Dave Thorpe Honda Off-Road Centre in Pontypridd, South Wales. The centre runs a range of off-road training, corporate days and taster events throughout the year using the very best motorcycles, equipment and coaches for riders of all levels, on some of the UK’s very best terrain. Customers wishing to take part in the experience days must have off-road experience. Each day can cater for 30-50 riders, with venues open from 10am-4pm. Customers are also welcome to bring and ride their own bikes, and catering facilities are available on site.